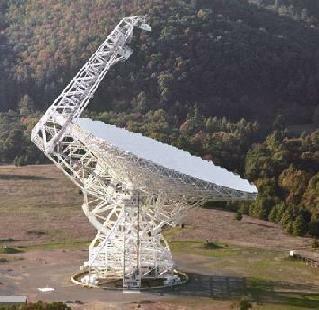 A West Virginia high-school student analyzing data from a giant radio telescope has discovered a new astronomical object -- a strange type of neutron star called a rotating radio transient. 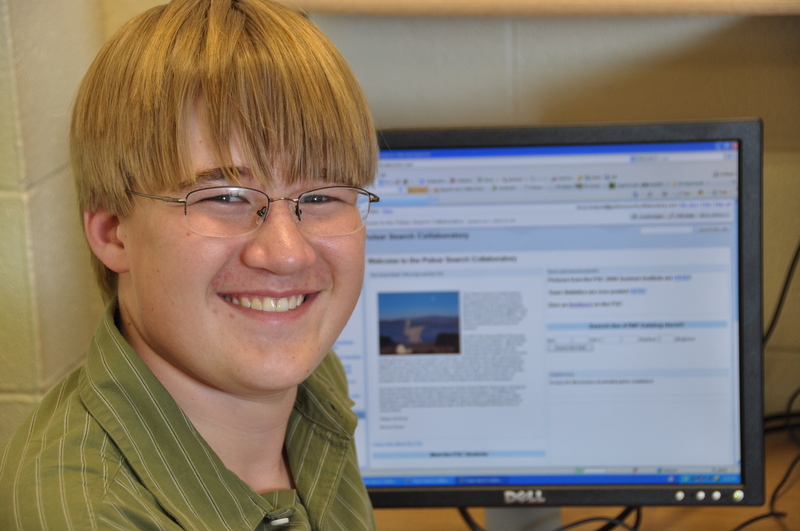 Lucas Bolyard, a sophomore at South Harrison High School in Clarksburg, WV, made the discovery while participating in a project in which students are trained to scrutinize data from the National Science Foundation's giant Robert C. Byrd Green Bank Telescope (GBT). The project, called the Pulsar Search Collaboratory (PSC), is a joint project of the National Radio Astronomy Observatory (NRAO) and West Virginia University (WVU), funded by a grant from the National Science Foundation. Bolyard made the discovery in March, after he already had studied more than 2,000 data plots from the GBT and found nothing. "I was home on a weekend and had nothing to do, so I decided to look at some more plots from the GBT," he said. "I saw a plot with a pulse, but there was a lot of radio interference, too. The pulse almost got dismissed as interference," he added. Confirmation didn't come until July. Bolyard was at the NRAO's Green Bank Observatory with fellow PSC students. The night before, the group had been observing with the GBT in the wee hours, and all were very tired. Then Lorimer showed Bolyard a new plot of his pulse, reprocessed from raw data, indicating that it is real, not interference, and that Bolyard is likely the discoverer of one of only about 30 rotating radio transients known. "These objects are very interesting, both by themselves and for what they tell us about neutron stars and supernovae," McLaughlin said. "We don't know what makes them different from pulsars -- why they turn on and off. If we answer that question, it's likely to tell us something new about the environments of pulsars and how their radio waves are generated," she added. "They also tell us there are more neutron stars than we knew about before, and that means there are more supernova explosions. In fact, we now almost have more neutron stars than can be accounted for by the supernovae we can detect," McLaughlin explained. "The students get to actually look through data that has never been looked through before," Rosen said. From the training, she added, "the students get a wonderful grasp of what they're looking at, and they understand the science behind the plots that they're looking at." For at least one student, the PSC has brought to life the excitement of discovery. 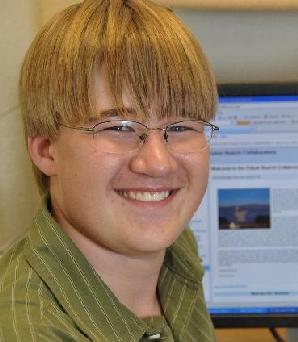 "Science is a lot more exciting for me now that I've made this discovery," Bolyard said. Scientific research, he learned, "is a lot of hard work, but it's worth it!" A year ago, he said, he wouldn't have thought of astronomy as a career, but the experience of discovery made astronomy at least a possibility for him. However, he added, "I'm still hoping to be a doctor." When Lucas Bolyard looked at the bottom plot, he noticed the thick, black blob left of the center. He saw that this signal was positioned on the graph where it indicated a non-zero "dispersion measure," or DM. Dispersion measure is used by astronomers as an indicator of cosmic distances. 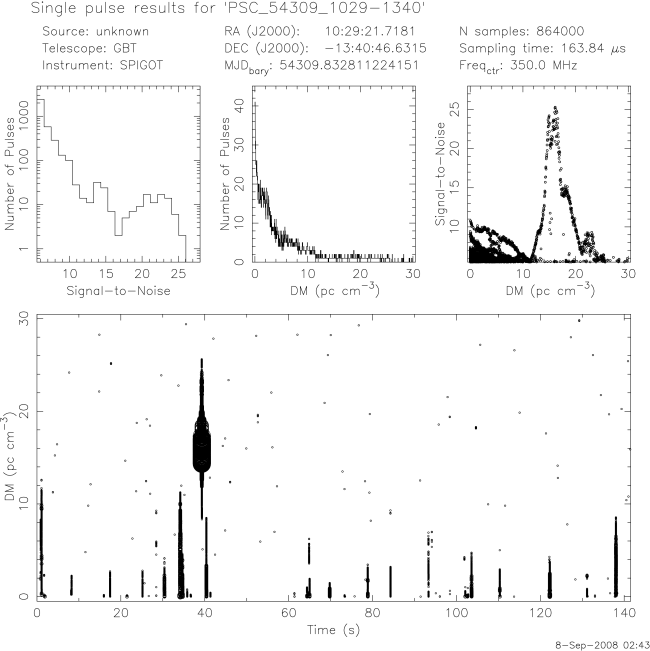 The non-zero DM value of this pulse is a clue that the signal came from space, not from Earth. The other blobs on the bottom of the graph are signals at a distance of zero-- that is from here on Earth.